The epic comedy video game heroes Sam & Max can now continue their freelance police work on your iPad. Developer Telltale Games kicked off the latest season of Sam & Max’s ongoing adventures, entitled “The Devil’s Playhouse,” with Episode 1: The Penal Zone. 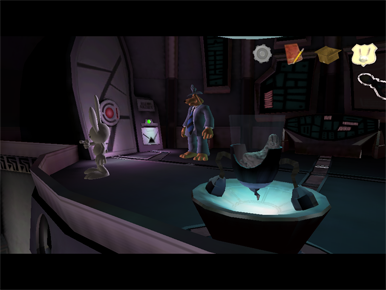 Sam & Max: One's a dog in a suit, the other is a homicidal bunny-thing. In case you’re not familiar with the Sam & Max series, here’s a quick primer: Sam is a 6-foot tall anthropomorphic dog, and Max is his crazed rabbit sidekick. The two animals fight crime and bust bad guys, all without a permit. And they make a lot of jokes while they do it. The first thing you’ll notice about The Penal Zone on the iPad is how impressive it looks. The game features a rich, immersive 3D look, and the interactive moments are nearly as well-rendered as the cut-scenes. And as with other Telltale Games puzzle adventure games like Tales of Monkey Island, you will need to sit-through many cut-scenes, since they tend to contain useful information you’ll need to progress. Fortunately, the cut-scenes are loaded with humor and pleasant to look at; the game really feels closer to a playable, interactive television show. On the iPad, “The Penal Zone” unsurprisingly relies on dead-simple touch gestures: you tap on objects you’d like to interact with, and you drag your finger to indicate where you’d like to go. Letting your fingers do the walking, running, and climbing feels mostly natural, and tapping to switch between which character you’re controlling, or to access your inventory, works great. This episode, which sports a delightful, Rod Serling-inspired narrator (perpetually rendered in black and white, of course) pits Sam and Max in a battle against Skun’ka’pe, an incredibly intelligent gorilla from outer space. Skun’ka’pe wants to collect a series of children’s toys that could afford him all sorts of preternatural powers, and to snag a queen while he’s at it. Through a lengthy series of engaging, well-paced challenges, you’ll explore tons of eye-popping locales, engage in amusing conversations with all sorts of characters, and eventually figure out the puzzles the game sets before you. Max (that’s the bizarre bunny) quickly learns that he can avail himself of all those magical toys that Skun’ka’pe is after, and you’ll frequently go back to his newfound powers (like teleportation via a toy phone, or self-transmogrification via what is essentially Silly Putty) to solve puzzles. The configurable in-game hints system can tip you off incessantly about what to do next, or you can adjust the system so that you’re entirely on your own. As you get familiar with Max’s abilities and the quick escapes they can provide, toggling back to control his character for some magical assistance becomes more second nature. As strong as each of the game’s core elements is, The Penal Zone is not perfect. In fact, the game’s a bit glitchy. On occasion, I’d take an item out of my inventory, and even be told explicitly what to do with it now that I had it in hand, but the action wouldn’t work. Instead, I’d have to go back into the inventory a second time and take hold of the object I was theoretically already wielding. Occasionally, the game’s incredible presentation seems to be a bit much for my iPad; characters would freeze for a moment, audio would sometimes stutter or echo (“I don’t have anything to do to do to do with that”), and occasionally after tapping certain action buttons, five or ten seconds would pass before anything happened. You’ll also encounter plenty of loading screens as you play, and every once in a while the loading screen lacked the standard “loading” animation, so I’d be staring at an all-black screen wondering if something had crashed. Truth be told, though, the rare glitchiness didn’t mar my overall Sam & Max experience. This is a deep, fun, and thoroughly enjoyable iPad game, and I’m eager to play the episodes still to come in “The Devil’s Playhouse” series.